The face wash gives a softer feeling to the skin. It removes dirt and dust particles from the skin gently. It contains rose oil, sandalwood oil, aloe vera, rose water etc. Vedantika Herbals Rose Sandal Face Wash contains rose oil, sandalwood oil, aloe vera, rose water, glycerine, honey, and spring water. It removes dirt and dust particles from the skin gently. It acts as a natural cleanser, giving a cooling effect to skin. This is excellent to treat sunburns. The face wash gives a softer feeling to the skin. It helps reducing the spots and gives blemish-free skin. It gives a radiant look to the face. 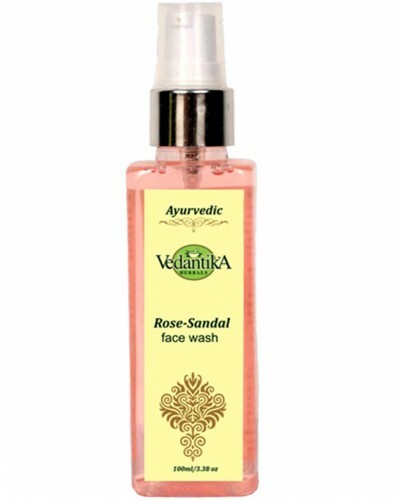 Vedantika Herbals Rose Sandal Face Wash protects the skin from irritation. Aloe vera in this face wash helps in healing any infection or cuts on the skin. Glycerine deeply moisturizes the skin. This product contains spring water, which makes skin bright and radiant. It guards against skin aging. It improves skin health and maintains skin elasticity. For a natural glow to the face, use Vedantika Herbals Rose Sandal Face Wash. It is suitable for all skin types.